Credit: Sky & Telescope Diagrame. Brilliant Venus and faint Mars will be paired remarkably close in the sky. And on Friday evening, the crescent Moon joins them in a tight bunch, a beautiful sight. On Saturday Venus and Mars appear even closer together, with the crescent Moon now looking down on them from above. When it comes to “eyeball astronomy,” nothing is more satisfying than to see a pair of celestial objects appear close together in the sky, what astronomers call a conjunction. And 2015, notes Sky & Telescope’s longtime contributing editor Fred Schaaf, truly deserves to be called the “Year of the Conjunctions.” In January we watched Venus and Mercury come together in the evening twilight, and now comes a similarly close pairing of Venus and Mars. On Saturday they’ll appear 1/2° apart for viewers in North America. That’s about the width of a pencil held at arm’s length. In chambers that mimic Mars’ conditions, University of Michigan researchers have shown how small amounts of liquid water could form on the planet despite its below-freezing temperatures. Liquid water is an essential ingredient for life as we know it. Mars is one of the very few places in the solar system where scientists have seen promising signs of it – in gullies down crater rims, in instrument readings, and in Phoenix spacecraft self portraits that appeared to show wet beads on the lander’s leg several years ago. No one has directly detected liquid water beyond Earth, though. The U-M experiments are among the first to test theories about how it could exist in a climate as cold as Mars’ climate. Fresh comets like Siding Spring, which have never before approached the sun, contain some of the most ancient material scientists can study. The UMD astronomers’ observations are part of a two-year-long research campaign to watch how the comet’s activity changes during its travels. The slopes of a giant Martian volcano, once covered in glacial ice, may have been home to one of the most recent habitable environments yet found on the Red Planet, according to new research led by Brown University geologists. Geologists who analyzed 40 meteorites that fell to Earth from Mars unlocked secrets of the Martian atmosphere hidden in the chemical signatures of these ancient rocks. Their study, published April 17 in the journal Nature, shows that the atmospheres of Mars and Earth diverged in important ways very early in the 4.6 billion year evolution of our solar system. Heather Franz, a former University of Maryland research associate who now works on the Curiosity rover science team at the NASA Goddard Space Flight Center, led the study with James Farquhar, co-author and UMD geology professor. The researchers measured the sulfur composition of 40 Mars meteorites—a much larger number than in previous analyses. Of more than 60,000 meteorites found on Earth, only 69 are believed to be pieces of rocks blasted off the Martian surface. The meteorites are igneous rocks that formed on Mars, were ejected into space when an asteroid or comet slammed into the red planet, and landed on Earth. The oldest meteorite in the study is about 4.1 billion years old, formed when our solar system was in its infancy. The youngest are between 200 million and 500 million years old. Beautiful streamlined islands and narrow gorges were carved by fast-flowing water pounding through a small, plateau region near the southeastern margin of the vast Vallis Marineris canyon system. 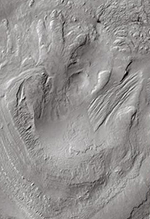 Images captured on 7 December 2013 by ESA’s Mars Express show the central portion of Osuga Valles, which has a total length of 164 km. It is some 170 km south of Eos Chaos, which lies in the far eastern section of Valles Marineris. Osuga Valles is an outflow channel that emanates from a region of chaotic terrain at the edge of Eos Chaos to the west (top in the main images). Such landscape is dominated by randomly oriented and heavily eroded blocks of terrain. Another example is seen at the bottom of this scene, filling the 2.5 km-deep depression into which Osuga Valles empties.